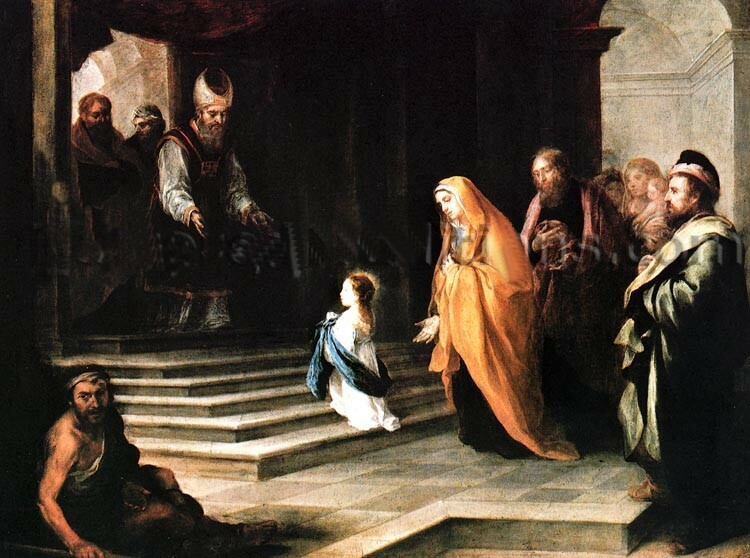 The Feast of the Presentation of the Blessed Virgin Mary, as it is known in the West, or The Entry of the Most Holy Theotokos into the Temple, as it is known in the East, is one of those feasts that are celebrated on the same date in both churches. Tradition has it that Joachim and Anne, Mary’s parents, had made a vow that they would consecrate their new born child to the Lord. They had been childless and in the tradition of so many great births in the Old Testament, Mary was born to someone who was thought of as barren. This is a very old feast and records of devotion to the Presentation of the Blessed Virgin Mary go right back to before the end of the second century. There is also an old tradition that this is the celebration of the day when Joachim and Anne took Mary to the Temple when she was three years old to begin her life of dedication to God. Mary remained in the temple until she was 12 or 14 years old when it would have been normal for her to be betrothed to a man. In Catholic tradition it is held that Mary’s parents had both died by the time she was eight. As a result of this she was able to devote her life totally to God. For me what is lively about this feast is that it shows the way that God orders all things to suit his purposes and at a time when Rome and force dominated the world he was able to bring the Prince of Peace to birth in a quiet insignificant manner. In this age when secularism appears to be in the ascendancy and the Church appears to be in crisis, it is good to remember that God is in control of all.